Neva's Legend Obolensky (Lenya) thats me! - would like to announce that he has today been neutered - I'm a little confused right now - and feel a little lighter in weight for some reason - but Mum says that it is for the best - and that I will enjoy the life I deserve at Chantaris as a very pampered puss. 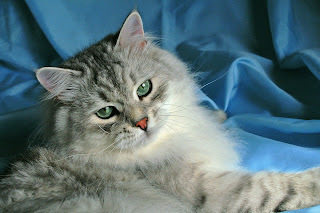 It apparently means that Chantaris have some changes in plans - but that really doesn't mean much to me - and really I'm not that fussed, providing I get sufficient quantities of rabbit and chicks, my favourite treats - and lots of cuddles. Scotland has even begun to grow on me - the language I am getting used to - and I hope it snows - as I really want to feel what that is like 'underpaw'. So Proud - Poppy achieves TICA Quadruple Grand Champion Title - 3 shows and 1 year old! Photo above taken with TICA AB Judge, Aline Noel Garel. Poppy doing her Meerkat impersonation! Well, its been some time since we posted, much has happened in our family over the past weeks. We travelled to the EW Regional Show in Bracknell in August, and Poppy achieved Double Grand Champion - we were so proud of her. It was a lovely show, and super to see Tavolga Sibaris again and also meet the very handsome Lyndongraey Riga. Our weekend was lovely - and we collected TICA RW SGC Musrafy Caledonia Mist's Awards for the previous Show Season, and these are now proudly displayed here at home. 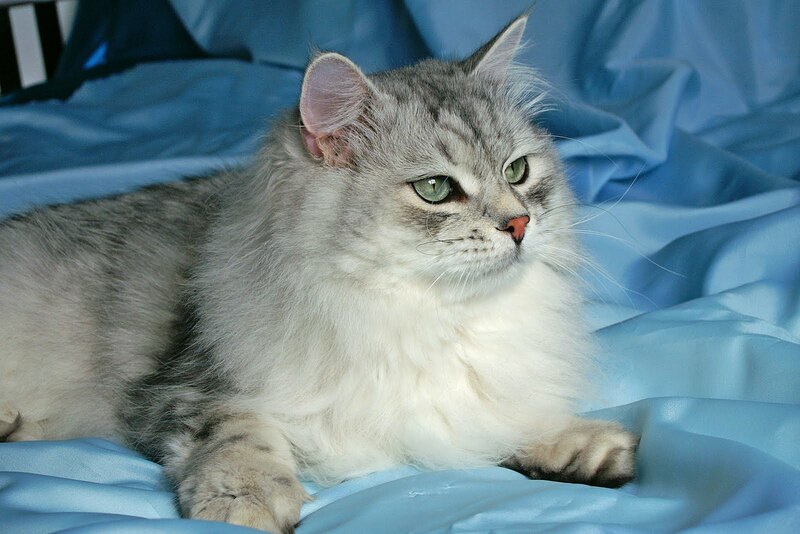 Last weekend we travelled to Solihull to the Bengal Cat Club of Great Britain Show, and again had the pleasure of seeing Tavolga Sibaris - who had Supremed at Swanley Show. Also to meet Musrafy Yanara and we had the pleasure of 'running' her on the Saturday - which was a great experience. Poppy had a lovely weekend, she loves the hotels, and behaved very well in the Show Ring - even though she was chatting most of the time to the Judges. She came home as TICA Quadruple Grand Champion - and we are so so proud of her. 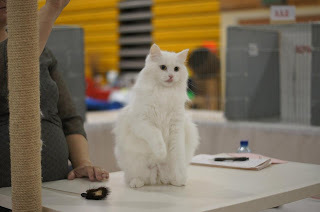 We never expected it, and can only thank her Judges very much for their awards, and also for the very positive comments, which we have received on our White Siberian breeding program. It augers well for the future. Thank you to all of our friends for their best wishes and congratulations - its lovely to have the support of you all. Showing Solid Siberians is tough, and the Solid White is difficult for sure - but we love them - and with our plans - we hope that we can bring a good solid foundation into these beautiful cats - Plans, of course are just that, plans - but we can only hope that they will come to fruition. TICA QUADRUPLE GRAND CHAMPION CHANTARIS POPPY POMFREY !! Having had a break from showing for a few months, we found ourselves wanting to support the Northern TICA Show at Altrincham, but with little to show. So we decided to take 'our Poppy'. We had a lovely show, and it was wonderful to meet Tavolga Sibaris of Snowgum - who had just arrived from Moscow, and who did fantastically well, finalling in 9 out of 10 Rings, including 2 Best Cats. 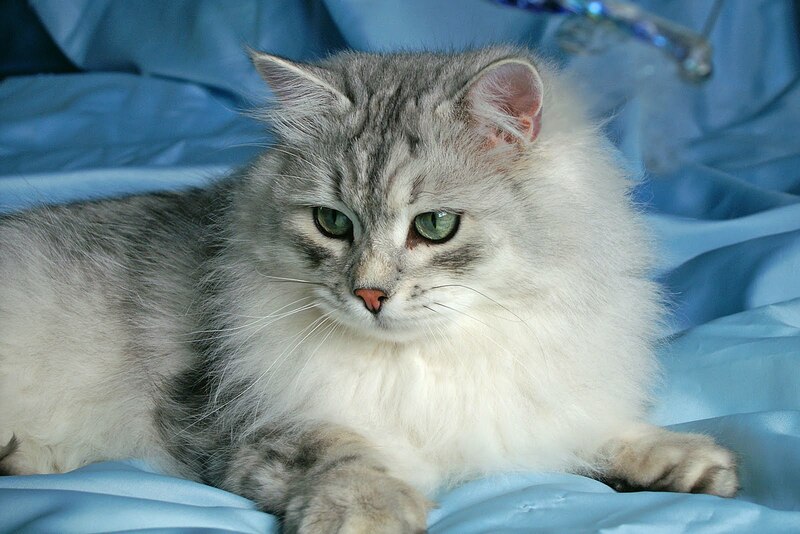 Our congratulations again to Meadow (which is her new name) and to Melanie at Snowgum Siberians - Meadow is beautiful, and will go from strength to strength. It was a pleasure to share the Show and to be beaten by this beautiful Siberian. Poppy had a great time, both in the hotel and at the Show, and finalled in 3 out of the 10 Rings - which we really hadn't expected at all. 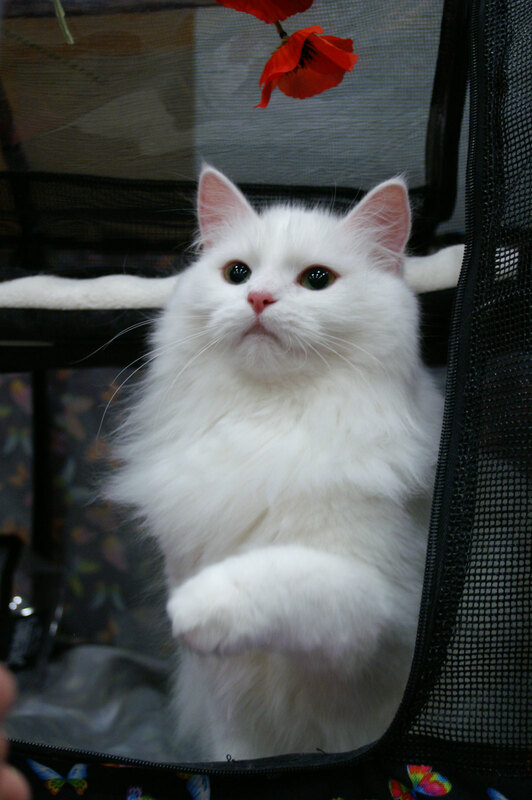 She even beat the male Siberian on the Sunday in 3 of the 5 Rings for 2nd Best of Breed! 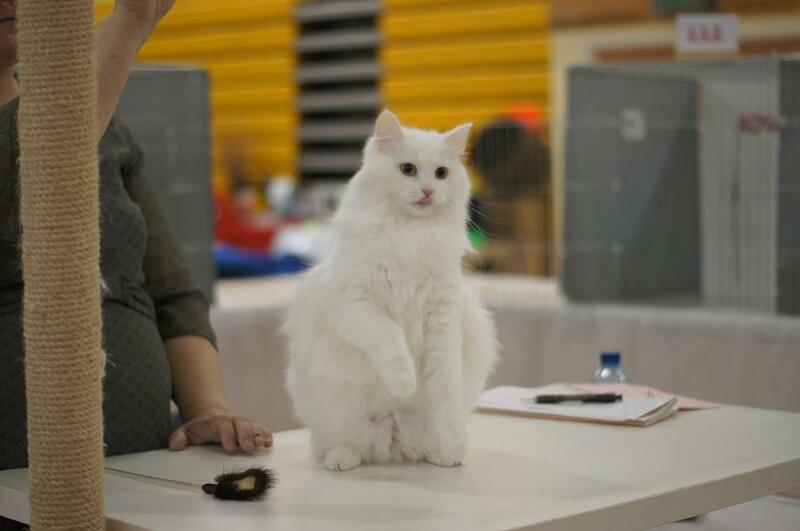 Given that he was a Brown Spotted Tabby, it was nice to see the Judges felt that a Solid White was good enough! The comments we received from the Judges were very positive indeed, and it gives us great hope for the future of our Solid White Breeding Program. We are very proud of her, and are thrilled, albeit surprised! who are the only Solid White Siberians in UK and TICA EW Region to hold a Title. 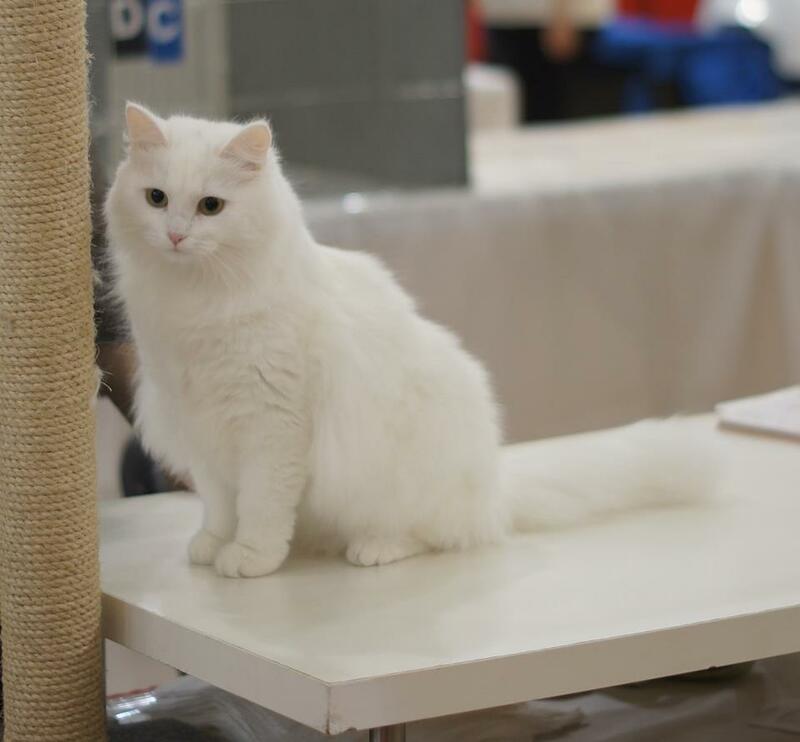 It makes us very proud to be owned by them, and we would like to thank both Laila and Milkana for the opportunity we had to have Darya and Ataman (Poppy's parents). Without these cats, none of this would be possible. The weekend was tinged with sadness, and we would like to pay tribute to RW SGCA Flutterby Dashing Hussar (Louis), owned by Steve and Janet - who was taken ill early on Sunday morning, and who unfortunately lost his fight for life later that afternoon. 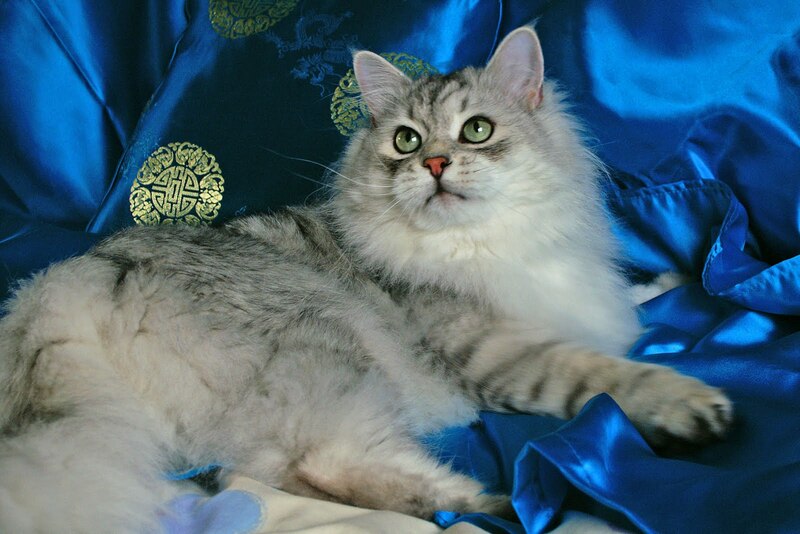 No words can express our feelings - he was a most wonderful boy - and at 2 years old - so very young. Our thoughts are with you and your family at this heartbreaking time. Well, after months of waiting - we are happy to announce that our new boy - NEVA'S LEGEND OBOLENSKY - has arrived in the UK. Our thanks to Valeria for agreeing to let him come to Scotland - we are delighted! We will update photos once he has settled. Obolensky will bring a further outcross to our lines - and we hope that he will be happy here in Scotland. Been quiet - but lots happening! Well, I've been very lax at posting, and have been busy - what with David deciding to try his hand at being Alan Titchmarsh and doing some splendid gardening - we now have an abundance of vegetables and herbs growing here - and just trying to catch up with things needing to be done. May 2nd saw Kirov's 4th Birthday - which he celebrated in style, having a lazy day (as usual) coupled with mad half hours every so often. May 25th saw Darya's 2nd Birthday - and she's developed so nicely since having her babies - maturing very well, and she's very special to us. Meantime, thank you for visiting the Chantaris Blog! Chantaris Poppy Pomfrey - 6 months old! Well, the Hogwarts are now 6 months old - and I thought I'd post a photo of 'our Poppy' - gosh it was difficult to get her still for long enough! She was desperately trying to pounce on the toys - but I managed to snap her - and so here she is - She's so sweet, with a wonderful nature - although she can be naughty - but we really are very happy with her. She's great fun, and her Mum seems to enjoy her company too! HAPPY BIRTHDAY ALTAI - 3 TODAY!!! Well today is a very special day - it is the Birthday of our wonderful boy - ALTAI!! 3 years old today. Still just a kitten. Hopefully he will have a lovely day playing with his friends, and enjoying watching the beautiful rain we have! We would like to wish him lots of love - and thank his breeder Maria for allowing us the pleasure of owning this stunning boy.